What is SIMD Data and Why Does it Matter? The Scottish Index of Multiple Deprivations (SIMD) is one of the key "Big Data" repositories of the Scottish Government for relating efforts and outcomes to those living in areas of deprivation, generally at a postcode level. Whether you&apos;re seeking to establish where you are making efforts, or showcasing the results of your efforts, by mapping your data against SIMD data, you&apos;ll be able to understand your programme effectiveness in reaching your population areas experiencing the highest levels of deprivation and share it with your key stakeholders clearly, whether they&apos;re the general public, economic development programme management, local authority, central government or beyond. Link your data to SIMD data to boost relevance and draw meaningful conclusions on programme efforts and outcomes. Depending on how it&apos;s used, SIMD data groups households together who are in close proximity into zones, then scores those zones based on a number of socio-economic factors. The scoring system can vary, based on how granular the results are which you&apos;re trying to achieve. Below is a vigintile graph showing the distribution of deprivation across 20 segments for our fictitious data, the local authority of Halcyon. It illustrates the count of startups which are located within all areas of the authority, with special attention given to those in the 3 hardest hit areas. Please note that throughout this document, we&apos;ll be using vigintiles exclusively from here on out. The bottom 3 areas represent the 15% of postal codes considered highest deprivation. 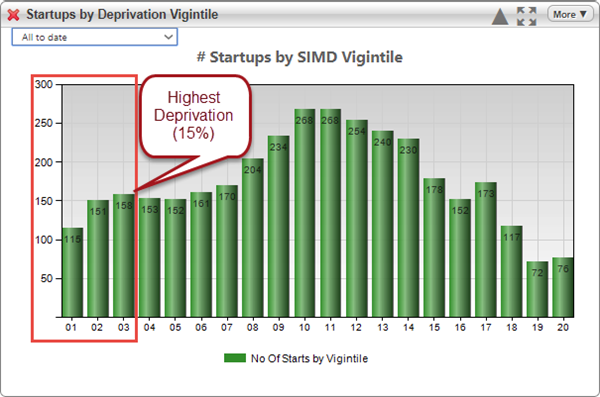 Choose your scale, depending on need, and use SIMD vigintiles to find the deprivation areas most in need of attention. How to Link to SIMD Data? By looking up the deprivation status for each of these instances, deprivation scoring or a yes/no indicator, can be supplemented onto tabular data. Start with basic data about the company and owner, including location data. Link to, or supplement, basic data with SIMD data using postal code lookup. Link your data with SIMD to boost relevance and enable analysis of programmes targeting deprivation areas. Pie charts aren&apos;t great for many occasions, but when you&apos;re wanting to know the relationship between segments and the whole, such as between startups inside vs outside of deprivation areas, pie charts are ideal. See the # and % of startups inside and outside of deprivation areas. Use a pie chart to easily compare startups from inside deprivation areas as compared to those outside. Now that we&apos;ve established our baseline expectations, the next step is to track performance over time, to see how many new startups have happened in our target areas. See startups in deprivation areas over time. Use a line chart to easily track startups in deprivation areas, and group by quarter to quickly spot the trend. Spotting the trend is helpful, but sometimes we need to know how we&apos;re doing in deprivation areas, as compared to all our startups. This is good to find movements which reflect the effect of events we&apos;ve put on, or advertising campaigns, to attract startups in these areas. See startups as a whole vs deprivation area starts. Use an area chart to easily track, over time, startups from inside deprivation areas as compared to all new starts. See #&apos;s vs %&apos;s to find relationships and anomalies. Use an area chart plus line to easily track, over time, the count vs percentage behaviour. Are We Doing Better Than Last Year? By using a year-on-year comparison chart (two areas graphed together), we can stay abreast of our performance compared to previous periods, such as the year prior. Compare this year with last to see how well the deprivation areas are responding to ads and PR. 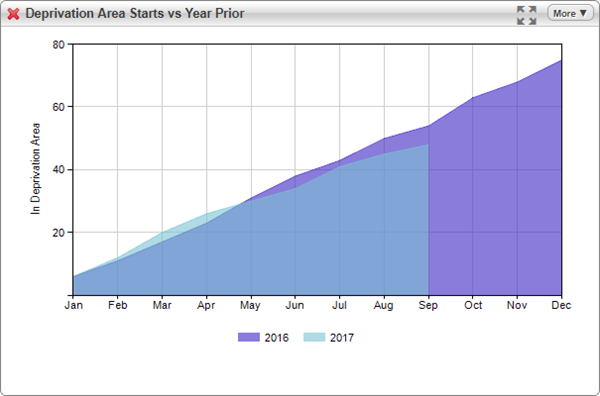 Use a year-to-date area chart to quickly compare historical and spot improvements. A donut chart can be a useful way of getting the segment vs segment comparison of where our startups are located. Find out which wards have the most deprivation area starts. Use a donut chart to showcase geographic distribution of deprivation starts. Linking to SIMD data, and using it to explore performance in deprivation areas, is a great way to expand your capabilities with a minimum of effort. 1. Link, or import, SIMD data, based on startup postal code. 2. 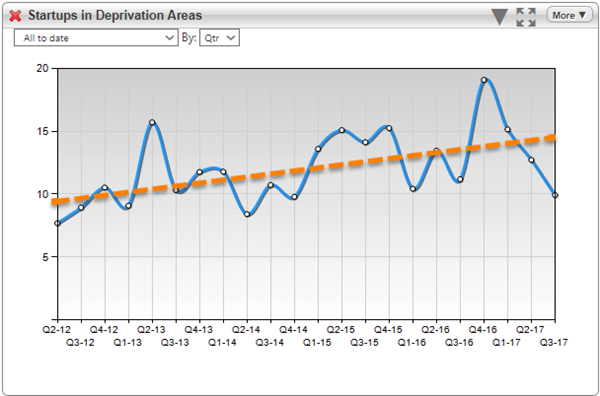 Create baselines to set expectations for deprivation area as a % of the whole. 3. Plot the historical trend, using quarterly grouping, to determine if tracking to improvement. 4. Compare deprivation area # of starts vs all starts for segment relative performance. 5. Examine % vs # to spot anomalous behaviour. 6. Use cumulative year-to-date vs prior to know if we&apos;re improving. 7. Link to ward / geospatial data and find concentrations of deprivation area starts. 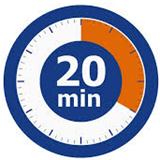 Consider dashboard data management software for always up-to-date visualisations to save time spent in Excel each month, improve effectiveness and reduce re-keying errors.